Opening the library with huge scissors! Last month, the 26th to be exact, I was invited to visit Hollywell Primary school, perform my poems, make poems with the children and open a BRAND NEW LIBRARY. It was a great honour and I was really pleased to be asked. And there was CAKE, oh and pirates, knights in armour, princesses, Daft Morl from Star Wars………(at least I think that’s what he said)……all kinds of people. Either this school has the weirdest uniform in the world OR it was dress up as a book character day. All the grown ups were in fancy dress as well as the children. I had a Harry Potter T shirt on so I think that counted. You just can’t have enough books. I have MILLIONS of them…can’t have enough. Impossible. End of. 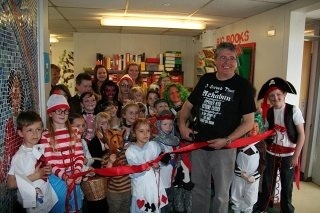 Here’s a couple of photos of me opening the library. 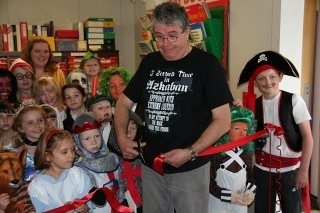 Opening the library with the help of a pirate. This entry was posted in Uncategorized by davidharmeruk. Bookmark the permalink.